MyHeritage is excited to announce a new pro bono initiative — DNA Quest — to help adoptees and their birth families reunite through DNA testing. As part of DNA Quest, we are giving out 15,000 MyHeritage DNA kits — worth more than one million dollars — for free, with free shipping, to eligible participants. We hope to make this project a shining light for corporate philanthropy and an example to be followed by other commercial companies in their own lines of expertise, to help make our world a better place. More than 7 million Americans are adopted, and many are searching for their biological parents or siblings. Currently available avenues for searching include formal adoption records, adoption agencies, and genetic testing. Formal adoption records are often unavailable or difficult to obtain, and research can be frustrating, costly, and time-consuming. Meanwhile, every year some adoptees and their biological relatives pass away, missing the chance to reunite — so this search is time-sensitive. Fortunately, genetic genealogy opens new doors in the search for relatives and reunions can sometimes happen in the blink of an eye: all it takes is a single match. MyHeritage believes everyone should be able to access this valuable technology. 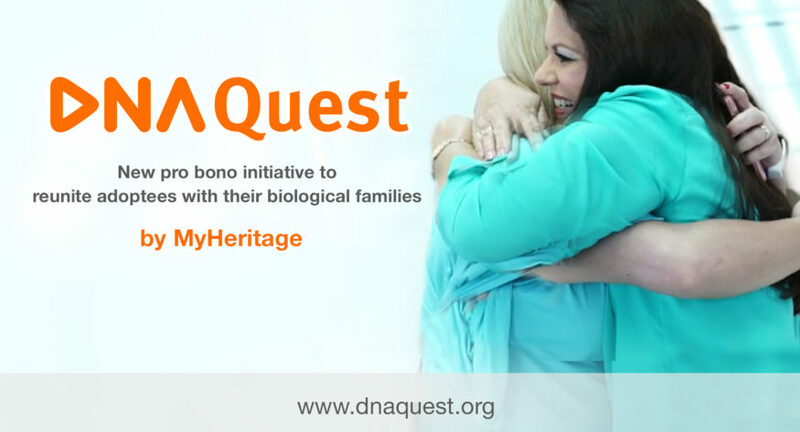 DNA Quest is an expansion to the U.S. of another successful MyHeritage pro bono project to reunite adoptees from the Israeli Yemenite community with their biological families. In that ongoing project, MyHeritage has contributed 1,200 DNA kits for free, provided professional and emotional support, and facilitated successful reunions between adoptees and their biological siblings, solving challenging cases where those involved were searching for each other without success for more than 60 years. Two sisters meeting each other for the first time after 67 years. There are already more than 1.25 million people in the MyHeritage DNA database, and it’s growing by thousands every day. Additionally, MyHeritage is unique among the top three DNA companies to offer the option to upload DNA results from other test providers, and we provide this option for free. We’re uniquely positioned to reunite families and have indeed facilitated many emotional success stories. This is why we believe we are the right organization to take on this endeavor, at the right time. MyHeritage has set up an advisory board of top experts in the fields of genetic genealogy and adoption to guide and support this initiative on a voluntary basis. This alliance ensures the best possible professional support for participants, with each advisory board member bringing unique expertise. The advisory board includes: CeCe Moore, founder of The DNA Detectives; Blaine Bettinger, The Genetic Genealogist; Richard Weiss of DNA Adoption; Richard Hill, DNA Testing Adviser; Katharine Tanya, founder of Adopted.com; Brianne Kirkpatrick, founder of Watershed DNA; Leah Larkin, The DNA Geek; and Susan Friel-Williams, Vice President, American Adoption Congress. Participation is open to adoptees seeking to find their biological family members, or anyone looking for a family member who was placed for adoption. Preference will be given to people who are not able to afford genetic testing, and to those who apply first. The first phase of the initiative is open to U.S. residents, involving adoptions that took place in the U.S. Additional phases may be considered in the future based on the success of the first phase, which begins now. Future phases may include other countries as well as additional circumstances, such as children of sperm donors and non-paternity events. Adoptees and family members searching for their biological relatives can apply for a free MyHeritage DNA kit at DNAQuest.org through April 30, 2018. Participants will be selected, and their free DNA kits will be shipped to them by the end of May 2018. Results are expected as early as July 2018. The DNA Quest website includes additional information about the initiative, and a detailed section with answers to frequently asked questions. Those who have already taken a DNA test with another company are invited to upload their DNA data to MyHeritage for free and participate in this initiative as well. The privacy of all applicants and participants will be strictly enforced. The DNA is owned by the participants and not by MyHeritage. The company has never sold genetic data and has pledged to never do so in the future without users’ explicit consent. DNA Quest is strictly a pro bono project. If you know anyone who may benefit from DNA Quest, please help by spreading the word on social media and include a link to the www.dnaquest.org website. And if you can benefit from this yourself, don’t hesitate to apply now. The entire MyHeritage team is very excited to launch this pro bono initiative to help families reunite through the power of genetic genealogy. We look forward to the life-changing reunions that will surely take place as a result of DNA Quest. MyHeritage Completed Digitizing All of Israel’s Cemeteries! I would like the free DNA test for adoptee’s.I have looked for years to no avail. Would like to see if I am acceptable for free test. I just received my kit in yesterday’s mail! I’m going to take it to the post office as soon as they open today! I’m so excited about the possibility of meeting birth siblings! iam a 57yr old disabled female with a daughter and 2 grandchildren. I would love to know and them to have a clue who we are .we are all we have left. I was so called adopted at birth I met woman who gave birth at 22, never got along. her and both adopted parents have all passed. I knew almost nothing of biological female .I believe my adopted dad or one of his brothers are my dad. it would never be spoken of it was humiliating for adopted mom .Iwrong but don’t think so. biological gave me 3 other names. she had to other ch. this is a mess can you help. pleaseildren by different men. adopted mom had 4 children all passed at birth .biological family there is a lot of mental illness .when she gave birth she put adopted mom name as hers .there was no legal adoption. thanks so much hope you cam help. I am an adoptee and would love to qualify for a free DNA testing. Would love to know who I am and where I’m from. I am an adoptee that does not know any name(s) of either birth parent. Closed Texas adoption with zero hope of ever getting information. Single mom of a 13 year old who can not fill out a family tree. Barely live paycheck to paycheck, then set back when laid off. I can not see anytime in my future when I will be able to afford a DNA test, it will never make the budget. Place to live, food, clothes (for son), shoes (for son), electricity, water, car insurance, gas and all the other necessities of life before expensive DNA test. First time I have ever seen people trying to help pro bono and didn’t see it till this morning. Suppose there is what happens when you give up hope. I hope you do it again sometime. That puts a glimmer back into people who have given up hope. Wasn’t involved, but thank you for helping all the people you did. My son is my reason, and you are now the glimmer. Just learned about the Quest program and now it’s too late to apply. I need to know if you can still help me. I have DNA results with Ancestry but can only find first/second cousins but not willing to give information. I have birth mother’s name but she doesn’t want to be found, don’t even know if she’s still living. I just want answers and information, I believe I have half siblings and I’d live to know who my biological father is/was. U found out very late in life so not expecting much other than information. You can upload your Ancestry results to MyHeritage to get free DNA Matches with us as well. Visit http://www.myheritage.com/dna/uploads for more information. I was giving away when I was 6 weeks old. I would love to find out who my family is since I was never adopted. And why you just gave me away. I’m disabled I have 3 children and grandchildren. So if you can help me I would be so grateful for it cuz I have looked before but have never had any luck. So if you will have it in your heart to help me find my family I would be so grateful. Please sign up for our DNA Quest waiting list at https://www.dnaquest.org/. Hi just hearing out your services and regretfully your closure date. If you open back up again please notify me. I’m 63 years old,adopted and would love to about my biological family. Would really like to know my family my mom was adopted when she was 3days old we have recently tried to find her birth parents with no luck the courts give us the run around. With my kids medical issues I have always wanted to know what our medical history looks like because I don’t know is always hard to say when doctors ask what our history looks like. More information on this would be awsome. I have done a free trial on ancestry and all it gives me is information I already know. I wish I would have known about this free kit for my step mom. She is 62. Was adopted. Received name of deceased bio mom who hid her pregnancy..and lied and said she died at birth. The woman died with all her secrets and no name of who the black man is or was that would be her dad and not the man she was married too. I can’t afford a kit but I wish I could so she could hopefully gets answers and closure. She acts like it’s ok but I know better. We can tell. It’s like she drinks to cope the pain. Especially after five ding out she was told the woman told everyone she died at birth and never to speak of that day again. My sister in law, Vivienne Roderick new Heaney, was adopted at birth. She would like to trace her father’s family. Would she be eligible for a free DNA test kit? Thanks for getting in touch. We suggest that you sign up for the DNA Quest waiting list to take advantage of future opportunities.